Want to see Koala Blooms plants in a garden setting? 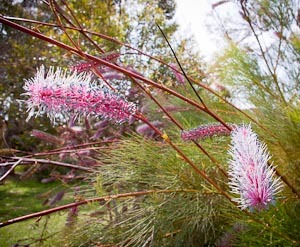 Visit the Australian Gardens at the Arboretum & Botanic Garden. While you're there visit our other gardens. The Koala Blooms plant introduction program is a joint venture between the Arboretum & Botanic Garden at UC Santa Cruz, nursery growers here in California and growers in Australia. 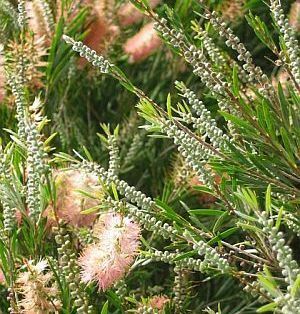 Plants are initially imported to the Garden from Australia and are trialed in the garden. Selections are made and these plants undergo trials by the wholesale nurseries participating in the program. In this collaborative effort, many impressive Australian plants are evaluated for their beauty, durability in landscape situations and sturdiness with regards to drought, weather extremes and variations in soil types. Out of this trialing process new plants are selected and offered for sale to the public. 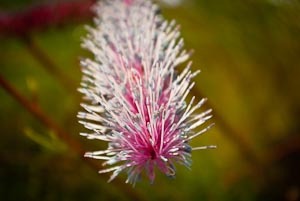 When you purchase a Koala Blooms plant, a portion of the profit comes back to the Garden to help support our gardens. Another portion of the profits go back to the growers in Australia who selected or developed the plants originally. Norries Gifts and Garden Shop or by contacting Martin Grantham at mgrantha@ucsc.edu phone: 831-502-2998. Sierra Azul Nursery in Watsonville. 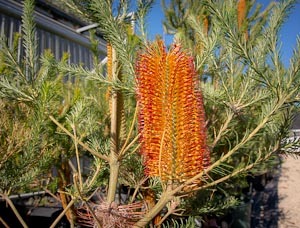 This is a striking Banksia with large showy flowering cones and dark green needlelike leaves. Great cut flower. If you apply fertilizer or soil amendments, use those with little or no phosphorous. The small evergreen shrubs have needle like foliage and showy red new growth. Brushy red flowers. Drought tolerant once established. It is a recent Koala Blooms introduction. A dwarf tufting slender perennial to 2 feet tall with bright green angular wiry stems and narrow lance shaped leaves. 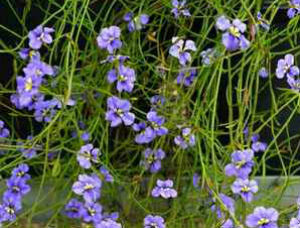 The blue-violet flowers, nearly 1 inch wide with yellow centers, are held singly or in pairs on long peduncles at the stem tips from spring through summer. Plant in full to part sun in a reasonably well-draining soil and irrigate regularly to occasionally. This is a dramatic and unusual specimen plant. Flower wands extend up 8 or 9 feet from the ground. If you apply fertilizer or soil amendments, use those with little or no phosphorous. Irrigation requirements: Drought tolerant once established. The unusual leaves of this plant will grab your attention. The triangular leaves are dark bronze nearly black with chartreuse margins. 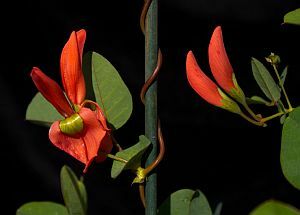 The large flowers are pale orange red when young and mature to a deep red. This shrub has a creeping habit. This plant flowers profusely and is attractive to pollinators. 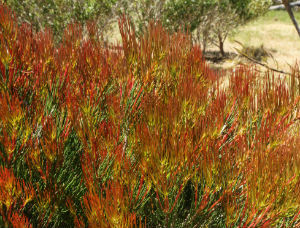 It is an attractive plant that is extremely drought tolerant, deer resistant and tough. It can be pruned to keep the size down. 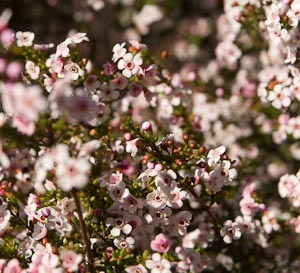 This little showy shrub has aromatic foliage and during its long bloom time, it is full of small 5 petaled flowers that start out being white and then darken to rose pink as they age. 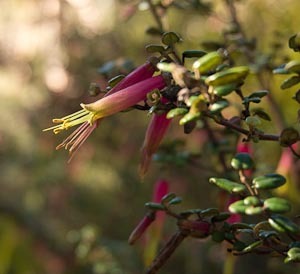 The dark green oval leaves of this Correa contrast well with its showy rosy pink tubular flowers. This is a good plant selection for growing under oak trees. 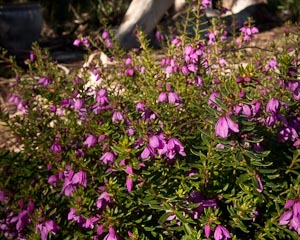 This is a hybrid correa made by Ray Collett, the founding director of the Arboretum. 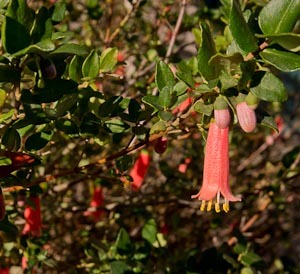 It is a cross between Correa pulchella and Correa reflexa. 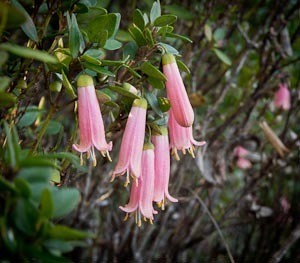 It grows very slowly and is often found in full bloom with its pendant vibrant bells in time for Halloween! Shiny deep green oval leaves contrast well with the numerous dangling blooms of this correa. 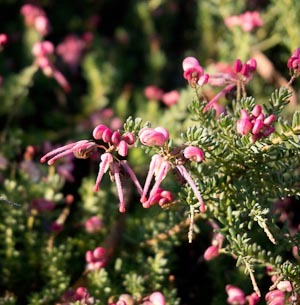 One of our most popular introductions, this grevillea makes a tough drought tolerant groundcover with a long bloom time. If you apply fertilizer or soil amendments, use those with little or no phosphorous. 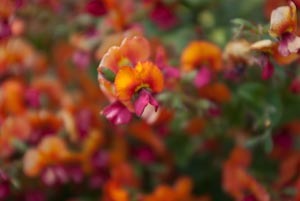 Spectacular 2 inch long orange-red colored flowers with a lime green spot. Attractive to nectar feeding birds. Foliage may suffer damage at low temperatures. 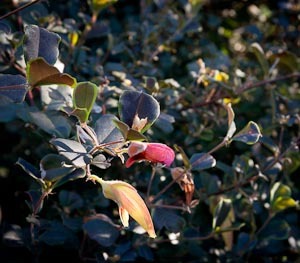 This is a bright little shrub with small dark green leaves and vibrant magenta flowers with dark purple centers.